This week, Tuesday Ten is focusing on blessings and I was reminded of this post I wrote in January 2015 (hence the reference to coats and backpacks.) I think we are all guilty of getting caught up in the "I want more" pitfalls, so we all need a reminder of our blessings from time to time. This is one of my favorite posts I have written and it is my reminder that, despite the messes and frustrations, I am blessed beyond measure. Everywhere I turn, I see a mess. There is a pile of shoes by the front door, cast off haphazardly the very second my children enter the house. There are coats and backpacks strewn about the living room carelessly tossed aside yet again. There are dishes piled high in the sink taunting me and a dishwasher waiting impatiently to be unloaded. There are stacks of folded laundry just begging to be put away and heaps more laundry anxiously awaiting a wash. There is dried toothpaste on the bathroom sinks and wet towels on the floor that have been discarded and forgotten. Ponytails ties, brushes, and other hair "necessities" are strewn across the bathroom counters. There are beds left unmade and I try to overlook the crumbs that littler the floor. Our dog drops black and white hair with every step she takes, dust gathers on ceiling fans, and fingerprints are scattered on the windows. I see papers - homework, bills, junk mail - littering almost every table in my house. I am a person who thrives on order and organization. Sometimes, when I look at these messes, I feel so incredibly exasperated. Over and over, I straighten and scrub. Over and over, the messes reappear almost instantly. Despite my best efforts, I cannot get ahead of the clutter and mayhem. Most days, it drives me crazy. If I take a breath and step back for a moment, though, I remember that these messes represent all that is wonderful in my life. In the evening, when all is quiet and I finally sit down to relax, I look around at the chaos that lingers and recall all the mess represents. The shoes remind me of the feet that have run and played all day; the feet that carried them to school and safely home again; the feet that used to be so tiny, but now almost match or even surpass my own. The coats remind me that we are all safe and warm. The backpacks signify how much they have learned and grown as the years have flown by so swiftly. Wasn't it just yesterday that I was teaching them to sing their ABC's? The dog hair is from a loving, loyal companion who also adds snuggles, comfort, love, and laughter to our lives. The dishes and crumbs help me to remember that we are fortunate to have food on our table; that I am lucky to put my children to sleep with full bellies each night when so many parents struggle to meet the most basic needs of their little ones. The laundry is another symbol of our blessings; a reminder that we are warm and able to provide for their most fundamental requirements; a reminder to be thankful because we have much when many have so little. I walk in the dirty bathrooms and remember the scent of freshly washed heads when they were little and even now, when they are not so little. I remember when they were so small they had no hair to comb on the bald little baby noggins & I cherish the moments now when they ask me to brush or braid the long locks. Every fingerprint is a memory smudged into my heart reminding me how it felt to hold their tiny hands and how it still feels to be wrapped in their embrace. The beds are where my sweet angels rest their precious heads each night; where they keep their most prized stuffed animal possessions; where they dream and, sometimes, where they cry; where they begin and end each day. If I let them, these messes get under my skin. That's when I know I have lost sight of my blessings. 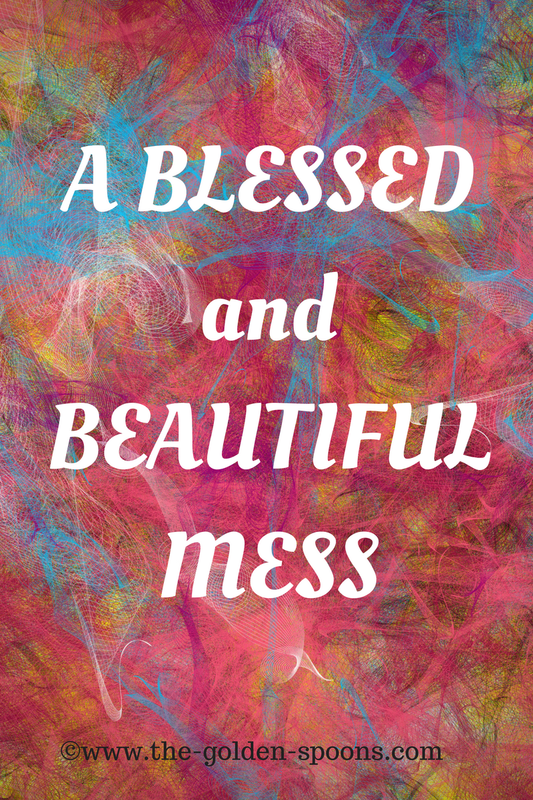 When I am overwhelmed by the clutter and chaos of life, I have to look harder, but, if I try, I can still find them - the love and blessings hidden deep within this marvelous, wonderful, beautiful mess. And, I wouldn't have it any other way.